James Stillman Rockefeller was born on 8 June 1902 at New York City, NY. He was the son of William Goodsell Rockefeller and Sarah Elizabeth Stillman. James Stillman Rockefeller married Nancy Campbell Sherlock Carnegie, daughter of Andrew Carnegie II and Bertha Sherlock. James Stillman Rockefeller died on 10 August 2004 at Greenwich, Fairfield Co., CT, at age 102. At the time of his death he was the oldest-known U.S. Olympic medal winner as well as the former head of the bank that grew into Citigroup , Rockefeller was the captain of Yale University's eight-man rowing team at the 1924 Paris Olympics. The team cruised ahead of the Canadians by less than 16 seconds, winning the gold medal. Another member of the crew was Dr. Benjamin Spock, renowned pediatrician and author.The oars from the winning race and the gold medal were prominently displayed in Rockefeller's house, grandson Stillman Rockefeller said. "I think he was really proud of that, probably more than the bank career," he opined. Stillman Rockefeller attributed his grandpere's long life to a regimented lifestyle: breakfast at 8 A.M., lunch at 1 P.M., a rye with water at 6 P.M. and dinner promptly at 7 P.M. He liked plain food and plenty of fresh vegetables, including those grown in the garden of his estate. Ever the Olympian, the elder Rockefeller was in good health until shortly before he died: He drove his car up until last year and would review documents from the various charities and businesses he helped lead, his grandson said. Nancy Campbell Sherlock Carnegie was the daughter of Andrew Carnegie II and Bertha Sherlock. Nancy Campbell Sherlock Carnegie married James Stillman Rockefeller, son of William Goodsell Rockefeller and Sarah Elizabeth Stillman. Nancy Campbell Sherlock Carnegie died in 1994. Andrew Carnegie II was born on 1 June 1870. He married Bertha Sherlock. Andrew Carnegie II died on 8 July 1947 at age 77. Bertha Sherlock married Andrew Carnegie II. One possibility is that George may be the son of Charles Holcombe, a blacksmith of Belchertown, MA. George and Sarah were enumerated in the 1900 New Britain, Hartford Co., CT, federal census. He was turner in a lock shop, age 42, she was 35. Children in the household were Charles F. 14, Lilly M. 13, Myrtle L. 10, Violet M. 8, George R. 5, and Aaron R. 2. George and Sarah were enumerated again in New Britain in the 1910 federal census. He was a machinist in a hardware factory, age 53, she was 45. Also in the household were son Charles F. 24, daughter-in-law Thekla 24, daughter Myrtle 20, daughter Violet 17, son Russell 15, son Harold 12, and son Raymond 7. Charles F. Holcombe was born in August 1885 at CT.1 He was the son of George Holcombe and Sarah E. (? )1 Charles F. Holcombe married Thekla (?) before 1910.2 Charles and Thekla were enumerated in the 1930 New Britain, Hartford Co., CT, federal census. He was a factory foreman age 44, she was 43. Children in the household were Althea 17, Virginia 16, Richard 14, and Steward 13. Charles and Thekla were enumerated in the 1940 New Britain, Hartford Co., CT, federal census. He was a machinist in a hardware factory, age 55, she was 54. Children in the household were Althea 28, Stewart 23, and Richard 24. George registered for the WWII draft while living at 66 Vine St., New Britain, Hartford Co., CT. He worked at the American Hardware Corporation, Russell and Erwin Division, and listed Christine as his closest relative. Thomas Sherwood of Stratford was the son of Possible Common Ancestor Sherwood. Thomas Sherwood of Stratford married Sarah Seabrook, daughter of Robert Seabrook, by 1642.1 Thomas Sherwood of Stratford left a will on 4 June 1657. He died by 1 Jan 1657/8. His estate was inventoried on 4 June 1658. [S536] Donald Lines Jacobus, "TAG 27:3 Sherwood." [S534] Bil Munsil, "Evelyn Martha Shaw," e-mail to James H. Holcombe, 19 Aug 2004. [S182] Social Security Death Index (on-line), Ancestry.com, SSDI, Ancestry.com, SSAN 527-34-8493. Thomas Sherwood Jr. was born in 1624 at England. He was the son of Thomas Sherwood of Fairfield and Alice (?) Thomas Sherwood Jr. married Sarah Wheeler circa 1646. [S535] Donald Lines Jacobus Families of Old Fairfield, Page 549. [S535] Donald Lines Jacobus Families of Old Fairfield, Page 551. 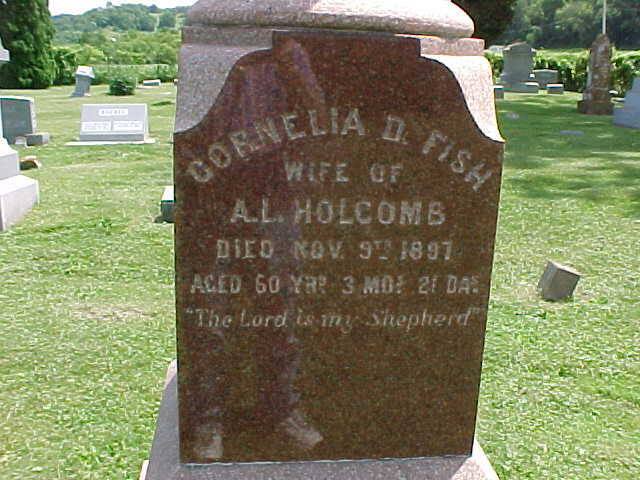 Cornelia D. Fish was born in 1837; GS.1 She married Albert Holcombe, son of Albern Holcombe and Elizabeth Thomas, in 1855; no children.1 Cornelia D. Fish died on 9 November 1897; GS.1 She was buried at Bear Valley Cemetery, Buena Vista, Richland Co., WI. Albert was enumerated in the 1900 Fremont, Sullivan Co., NY, federal census. He was a manufacturer, age 38; he was a widower, and no children were enumerated in the household. His parents were enumerated nearby. Albert and Elizabeth were enumerated in the 1920 Fremont, Sullivan Co., NY, federal census. He was a merchant, age 58, she was 62. There were no children in the household. Frank and Fannie were enumerated in the 1920 Hancock, Delaware Co., NY, federal census. He was a dairy farmer, age 60(? ), she was 55. Children in the household were Francis 24, Helen 19, and Irving 17. Annie Smith married Albert Holcombe, son of Irving H. Holcombe and Sarah Mary Hull, in June 1892.1 Annie Smith died; on her 25th birthday. [S182] Social Security Death Index (on-line), Ancestry.com, SSDI, Ancestry.com, SSAN 024-36-5911.